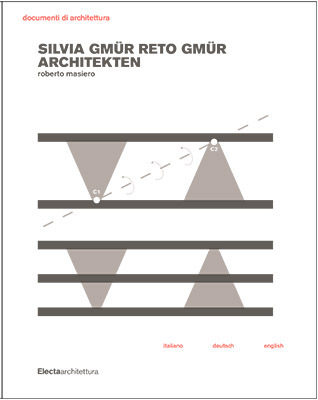 Monograph "Silvia Gmür Reto Gmür Architekten"
In El desierto Borges tells of a man in a desert near a pyramid, who scoops up a handful of sand and then letting it fall thinks to himself: "I'm altering the Earth's crust." Research into the architecture of Silvia Gmür, who long worked with Livio Vacchini and is now in partnership with her son Reto, questions this simple gesture and this radical reflection: "Building means changing the Earth's crust." The result is a rigorous architecture that seeks to elicit the poetic dimension by holding together the experience of space, the way people can live, the structure that holds together everything and the light that gives life. Dwelling is explored by Silvia Gmür above all in hospital design, which has become one of the constant themes of the office's research, following Le Corbusier's dictum: the hospital is the home of man. The simplicity of the gesture recounted by Borges and the radicality of the thought it gives rise to compels a highly determined and, in many respects solitary viaticum. There is no search for seduction for seduction's sake; there is no game of architecture as metaphor or effect; there is no gesture that claims to be authorial (or artistic). Her works deliberately avoid confrontation with the spectacular rhetoric of Post-Modernism in its many forms. And this happens in a context like Switzerland and Basel in particular, which continuously serves as a true laboratory of the strategies now possible for architecture, for his comprehension and even its destiny. It is undoubtedly a choice that goes against the tide of the times, and for this reason is all the more worth investigating.